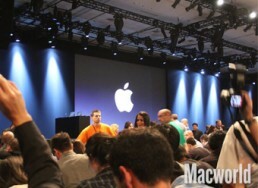 Editor’s note: Marketing mag’s sister publication, Macworld Australia, hooked itself up to an IV drip of coffee to cover the keynote address of Apple’s annual Worldwide Developer’s Conference (WWDC) from 3am AEST this morning. There are a number of announcements of interest to marketers, including updates to the next version of Apple’s mobile operating system, iOS 6, such as Facebook integration, enhanced functionality for ‘personal assistant’ Siri, and a brand new app called Passbook that is set to give Google Wallet a run for its (virtual) money. Good morning all, we are up and ready to cover Apple’s WWDC. What do we expect to be announced today by Apple CEO Tim Cook? 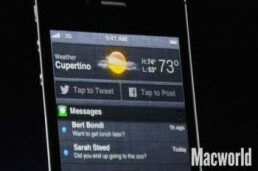 iOS 6 is a given, maybe Mountain Lion and a range of new Macs. Chance of a new iPhone? Follow us live as we find out. 3:00 AM – The lights are going down, and Tim Cook is on stage to a huge applause. Attendees from over 60 countries and more than 112 sessions, 125 labs. Over 400 million accounts on the App Store. Tim Cook talking about the app store and its impact. Apple’s written checks for over $5 billion to developers. App Store in over 120 countries in the world. Watching a video about how Apple has helped the community, including a blind man walking through a forest. A teacher in a school in India, showing off anatomy on projected on a sheet from an iPad. Medical learning on the iPad, using 3D models. Use the same app in medical schools and primary level education in India. Speech language pathologists using the iPad to help kids in a video. “Thank you for giving my freedom back.” The blind man from the beginning. Tim Cook is back on stage. Today, we’re announcing exciting changes in our notebook lineup, and major release of OS X and iOS. 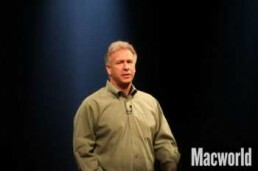 Phil Schiller’s coming up to talk notebooks. New third-generation Core processors (aka Ivy Bridge). Depending on config, up to 2.0GHz of dual-core i7 speed. With Turbo Boost up to 3.2 GHz. Up to 8GB of 1600MHz memory. Up to 60% faster integrated graphics. The Air is built entirely around flash storage. Now you can put up to 512GB into your Air. One of the reasons to use flash storage is that it’s zippy and quick. But now it’s even faster. Up to 2x faster, over 500MBps of read speed. Faster than any hard drive. I/O is faster too. 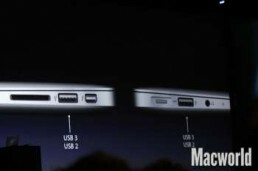 USB 3 is now here on a Mac. Up to 10x faster than USB2. Other people have started to add USB3. This is how they do it: separate USB2 and USB3 ports. Color-coded. Port on each side, and they’re both USB3 *and* USB2. Don’t have to think about it; use whatever port you want. FaceTime camera is updated to same as MacBook Pro. FaceTime HD 720p camera. 11-inch and 13-inch sizes, here’s the configs. As we’ve seen 1.7GHz dual-core i5, up to 4GB of RAM. Integrated graphics are Intel HD Graphics 4000. Prices are US$999 and US$1099—US$100 less expensive than before. 1.8GHz dual-core i5, faster memory, same Intel graphics. US$1199 and US$1499, both US$100 less than before. Best of all, starts shipping today. Next up, nice update to the Pro. 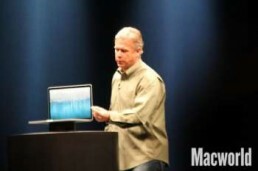 So, they’ve now got Ivy Bridge processors, speeds of up to 2.7GHz, and on the 15-inch quad-core i7. 1600MHz memory, and integrated graphics up to 60% faster. Discrete graphics are faster too, GeForce GT 650M (Kepler architecture), up to 1GB faster, and 60% faster than previous discrete graphics. 15-inch starts with quad-core i7, the GeForce GT 650M, hard drives, same battery life, at US$1799 and US$2199, same prices as before. That’s the update to the MacBook Pro, also shipping today. Across the board, Air and Pro all updated today (no mention of 17-inch, though). 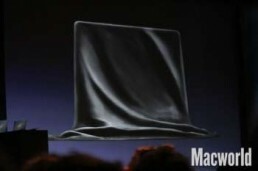 “There’s room on the side here…” A black-covered laptop has slid in. 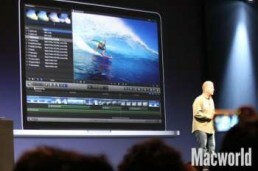 “With the MacBook Air, the team did something really bold. With the Air, they envisioned the notebook.” Used new technology, get rid of legacy technologies. Wired networking, optical drives, hard drives, etc. Next Gen Mac Pro (Retina display). Killer new display, architecture for the future, bold and bright, new design. Dominated by magnificent new display. But if you want to be shocked, turn it around. Turn it around to the side. It’s very thin. Very. It’s thinner than Phil’s finger. New next-gen MacBook pro. 0.71 inches thin. Closed, it’s about as fully thick as the base of the old MacBook Pro. About as thin as an Air. Lightest pro notebook than they’ve ever made. Lighter than 13-inch Pro. 4x the number of pixels. Density is 220 ppi. 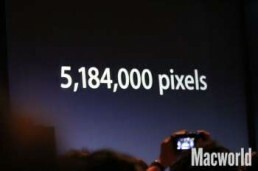 5,184,000 pixels. The world’s highest resolution notebook display. Ships with Lion, but all the apps are updated to work with the high-res display. Thumbnail views in iPhoto are gorgeous. Updating pro apps as well. Major update to Aperture; not only has whole UI been updated, but now looking at 4x the resolution of photos. Final Cut Pro X updated as well. The video area in the upper corner of Final Cut Pro is 100% pixel-for-pixel 1080p video. 3,000,000 pixels left over for your timeline, video effects, etc. Photoshop has been updated. “Jaw-dropping” says Phil.Detailed work and design never possible on a laptop before. Fastest quad-core processors. Up to 2.7GHz i7 processors. Turbo Boost up to 3.2GHz. Up to 16GB of 1600MHz RAM. Fastest graphics. GeForce GT 650M, Kepler graphics. Built around flash storage. Now configure up to 768GB of internal flash storage. Up to 7 hours of battery life and 30 days of standby. MagSafe 2? SD card. HDMI out. USB3/USB2 on either side. Two Thunderbolt ports. Headphone. Thunderbolt’s catching on. Here’s a Promise flash RAID drive you can plug in via Thunderbolt, for example. A fantastic Blackmagic camera over Thunderbolt. Apple’s making some adapters. Thunderbolt to FireWire 800 and Thunderbolt to Gigabit Ethernet. Glass Multi-Touch trackpad, naturally. Beautiful backlit keyboard. 802.11n Wi-Fi, Bluetooth 4.0. FaceTimeHD camera. Dual mics, using beam-forming. Best stereo speakers ever put into a desktop or notebook computer. “The very best computer that we’ve ever built.” —Jony Ive. So, if you were waiting for a platform transition, here it is: USB 3, HDMI, Thunderbolt x2, retina display…. this is not an iterative update. Oh, right, and all SSD. They spaced the fan blades asymmetrically so that the fan noise is not a uniform sound, but more dispersed. The screen is a part of the glass, not behind it. Similar to the iPad. 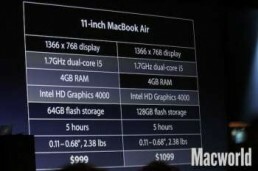 15.4 Retina display, 2.3GHz quad-core i7, 8GB of RAM, GeForce Gt 650M with 1GB of VRAM, 256GB flash storage. Starting at US$2199. Environmentally friendly as well. Energy Star 5.2, arsenic-free, mercury-free glas, BFR-free, PVC-free, highly recyclable. “That completes our notebook lineup:” great update to MacBook Air, great update to existing architecture MacBook Pro, and the new next-generation MacBook Pro. OS X – Mountain Lion. 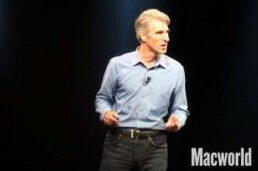 Craig Federighi is here to talk about OS X. More than a decade. 66 million Mac users, triple what they had just 5 years ago. Lion was the first released distributed electronically via the Mac App Store, making it easier than ever to purchase, download, and install. 26 million copies shipped to date. Best selling release ever. 40% of OS X users are running Lion. Achieved in 9 months. Windows 7 took 26 months to get to the same level. Here to announce Mountain Lion, less than a year later. Deliver world’s most advanced operating system for notebook and desktop computers. Interface optimized for multitouch trackpads, and mice. First up, iCloud. 125 million registered users. 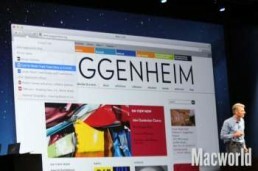 With Mountain Lion, build support for iCloud right in. Sign in to your new Mac with your Apple ID, automatically configure apps to work with iCloud. All of your content is up to date across all of your devices. 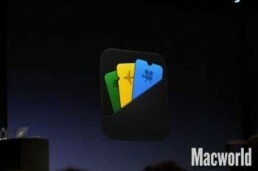 With Mountain Lion we introduced 3 new apps optimized for iClouds: Messages, Reminders, and Notes. Also bring integration for document-based apps. It does two important things: first, provides a simple new way to access and organize your documents. Launch an app like Pages and it comes up with a document library with a list of your Pages documents in the cloud. Available across all your Macs and iOS devices. Adopted in all of Apple’s key apps. Pages, Numbers, Keynote, Preview, Text Edit. Developer SDK for developers to add support in their apps as well. We’re watching to see what is new here versus what was announced when Mountain Lion was previewed earlier this year. A beautiful new glass Dock (can’t quite see it from here). Opens up Reminders. Downloaded from iCloud, multitouch gestures, location-based reminders. Notes app. All the notes you take on your iPad are available in Notes. Images and links supported, and open up notes in separate windows if you want to keep them around. iMessage on the Mac. Synchronized conversations, or answering a buzz from your phone on your Mac. Respond via iMessage, or FaceTime, or “legacy chat services”. You can send images and HD video too. Launch Numbers to see document library. Or open Previews to view PDFs. Add a document to that cloud library? Just drag and drop it in. Now available across all devices. Cloud-enabled iWork apps… I saw them demoed for me back when Mountain Lion was announced, and we’re seeing them here again, with more detail. Open up a poster in Pages. Because this is in his cloud library, also available on his phone. Here on his phone he can view and make changes to the document. As Craig changes stuff on his phone, it gets changed automatically on the Mac. Apps had their own way of getting your attention. 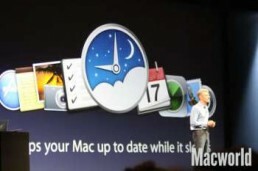 Mountain Lion has replaced all of this with a consistent system based on banners and alerts. Banners slide down in the upper right corner. Ignore them and they go away. Swipe with two fingers and you can see notifications. Alerts come in in the same way, but stick around until you dismiss them explicitly. Notification Center icon is changed; now it’s a small icon of a list of items, rather than a big circle. If you don’t want to be disturbed, there’s a switch to temporarily disable alerts and banners. Connect to a projector, and OS X will disable it for you automatically. Next, Sharing. Links, images, videos. Easier than ever to share right from within your app. Share button in the toolbar, and you’ll be presented with options. Twitter, for example, gets you the tweet sheet. Built-in across system. Any app where you can Quick Look, you can post it to Flickr, or other services. More than skin deep. Sharing services is built right into the OS. So when you go into System Prefs, enter your account info once and any app authorized can access and connect those services. Type in whatever you want and Safari will give you search suggestions, bookmarks, history, etc. Safari also has a feature called iCloud Tabs; click the cloud button on your toolbar and get a list of all pages open on all your other devices. Fantastic new feature called Tab View. Use gestures to visually navigate your tabs. Here’s Safari. Unified search field; type a few characters and Safari gives a top hit, search suggestions, bookmarks and history. Safari’s lightning fast page loading. New scrolling architecture built on Core Animation. Smooth and lightning fast. Open a tab from your other computer; click open tabs. Sites on iPad and iPhone. Keep browsing from where you left off. So, Lion already has gestures for zooming in and out. But in ML, if you zoom farther out, you get a live view of all your tabs, use multitouch gestures to scroll through them. Here’s the Share button. Craig’s going to tweet about the page, and done. Sharing in fullscreen iPhoto. Don’t have to leave the fullscreen mode to do it. Click on Share button, then Messages, and he sends it just like that. This is where Notification Center comes in, so you can stay in fullscreen mode and get your notifications. Notification Center also supports web services like Twitter and Facebook. You can tweet right from Notification Center, and use dictation to enter tweet. Pulling it all together…. notification center with tweet sheet with dictation. That’s the Mountain Lion trifecta. We all love using our Macs, but wouldn’t it be great if when we weren’t using them, they were still working for us? Power Nap keeps your Mac up to date while it sleeps. Fetches email, calendar, reminders, and even Photo Stream while it sleeps. It’ll even back itself up to Time Capsule and download App Store and system software updates automatically. Automatically refreshes data, entirely silent operation, power efficient. Compatible with recent MacBook Airs (2nd-generation) and the new MacBook Pro. Next up, AirPlay mirroring. Just go up to the AirPlay menu in your Mac’s menu bar, select a nearby Apple TV, in up to pixel-for-pixel 1080p resolution. Like iOS devices, which are asleep but still do stuff, this allows Macs to be “asleep” but still do stuff in the background when necessary, with constraints. Good move. It’s a renaissance of gaming on the Mac, says Craig. Game Center from iOS to the Mac. Same account with all your friends, achievements, and keep track of all your iOS and OS X games. Support turn-based and head-to-head gaming, both Mac-to-Mac and cross-platofrm iOS-to-Mac. 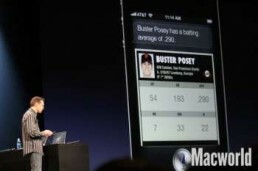 Here’s a demo of AirPlay and Game Center. Also send audio to AirPlay-enabled speakers. So, here’s Craig’s Mac and Apple TV up side-by-side. Upon selection, Mac display is mirrored to Apple TV in 1080p. Can do anything you’d normally do on your Mac via AirPlay. Mr. X is here to play Craig. Mr. X is playing on the iPad, and invites Craig. Craig gets a notification in Notification Center, and he’s instantly launched into the game. Originally an iOS title, but added to Mac. This is all over AirPlay. Oh, and Craig loses to Racer OS X. Dressed as the Stig from Top Gear. More features: VIPs in Mail. Search in Launchpad, Gatekeeper, and offline reading list where adding things to Safari Reader List, you can still read stuff when you’re offline. Features for China. Chinese input method improvements for PinYin. New Chinese dictionary. 8 new fonts for creating beautiful docs. Adding support for Baidu and social networking and video sharing for Chinese services. And make it easy to set up your Mac with China’s top email services. Also fantastic release for devs. More than 1700 new APIs. Sharing, Game Center support, Notification Center, gestures, high-resolution, and more. 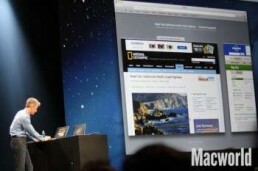 Mountain Lion will deliver to customers next month, shipping in July via Mac App Store. 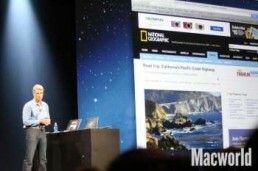 Lion was at US$29.99, but want even more people to get their hands on Mountain Lion. US$19.99. Upgrades from Lion and all the way from Snow Leopard. Single purchase will upgrade all your personal Macs. For those of you who buy a new Mac starting today, you’re upgrade to Mountain Lion will be free. All WWDC developers get access to near-final developer preview. 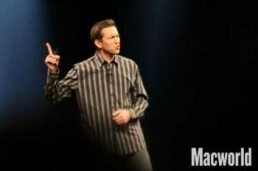 Next up, here comes Scott Forstall to talk iOS. 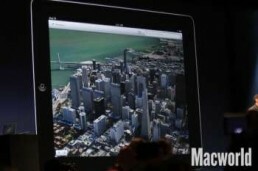 Good price, developers get to see the near-final with the new features today, and they’ve got a few weeks to finalize. More than 80 percent of customers are running very latest version of iOS, iOS 5. Compare that to the competition. A pie chart of hugely fragmented Android distributions. Review of iOS 5: Notification Center. 84 of the top 100 social apps sending notifications. 7 billion notifications per day. More than 1.5 trillion push notifications already. iMessage: 140 million iMessage users, sending 150 billion messages, currently sending more than 1 billion messages per day. Twitter integration. 3x growth in iOS users using Twitter. 10 billion tweets from iOS 5. Nearly half of all photos shared with Twitter’s photo sharing service come from iOS 5. Game Center. More than 130 million people using it. Submit 5 billion scores every single week, and 2/3rds of top 100 games integrate with Game Center. More than 75% of customers checked the top box of “very satisfied” compared to less than 50 percent for the competition. One reason customers are so satisfied is that every year since original iPhone we come out with a new release. This year’s no exception. Fantastic release. More than 200 new features. Starting with some significant enhancements to Siri. Siri’s only been out for 8 months, already does lots of stuff. Siri’s been learning a lot more for these eight months. So here’s what Siri can do in IOS 6. Buster Posey has a batting average of .290. Player card and stats. And you get the standings in a nice little graphic. Next up, Siri has learned a lot more about restaurants. Tap on any review and it’ll take you right to the Yelp app. Partnered with Open Table; tap to make reservations. Opens Open Table app. Siri’s become something of a movie buff. “Okay, found 8 movies at the Metreon.” Tells you what movies are playing. Integrated with Rotten Tomatoes for reviews. Tap to watch trailer right in Siri. Siri has also learned how to launch apps. Bam. Takes you to Temple Run. Just a few of the things SIri has learned in iOS 6. Way more. Sports scores, lot of leagues including English Premier League. “You’ve heard of hands free. Lets you keep hands on steering wheel while you’re using your phone.” Working with a number of car manufacturers to use a button on the steering wheel to trigger Siri. A number of auto manufacturers have already committed to deliver eyes-free Siri integration in the next 12 months. BMW, GM, Mercedes, Land Rover, Jaguar, Audi, Toyota, Chysler, and Honda. Making Siri more international. Adding English/French for Canada, (“Eh?” quips Scott), Spanish for Spain, Mexico, and the U.S.; Italian; Switzerland, Italian, French, and German; Korean; Mandarin for Taiwan, Cantonese for Hong Kong, and Mandarin and Hong Kong for mainland China. And Siri will for the first time come to the new iPad. Just a few of the enhancements for Siri in iOS 6. Working very closely with Facebook to create best Facebook experience ever on a mobile device. Integrating right in iOS 6. Enter your username/password in Settings. Don’t need to relogin when you launch another app. Post photos and websites from Photos and Safari, post locations from Maps, can talk about your favorite app. Movies, TV shows from the iTunes Store. Talk some smack from Game Center. And integrated with Notification Center. Drag down to post from Facebook or Twitter, right from Notification Center. Also integrated with Facebook from Siri. And made this integration a public API to make it easy for apps to post to Facebook. Didn’t stop there. Also integrated in the App Store. Like apps and see which apps your friends like. Also in iTunes Store with music, TV shows, and movies. If friends share email or phone number in Facebook, those will appear right in your iPhone on your iOS devices. And Facebook events appear in Calendars, along with birthdays. Same integration is on the Mac. Next, nice enhancements to the Phone app. Probably been in a meeting where you got a phone call, and wish you could quickly text person or remind yourself to call them back later. Slide up a control on an incoming call, and you can reply with a message or remind yourself to call person back later. Choose “send a message” and you get pre-made options (or custom messages) to send. Choose reminder, and you get options including “in 1 hour” or “when I leave” or “when I get home”, which use geofences. 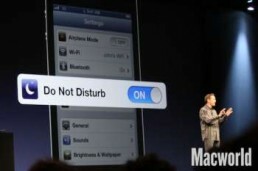 Next up, they’ve added a Do Not Disturb feature. Many of you have been awakened in the middle of the night by a text message, notification or phone call. The notifications will still come to your phone, but just won’t light up the phone or make a sound. Also get fine-grained control over which phone calls you receive. No phone calls at all, just phone calls from your favorites, or from a group that you create in your contact list. Last option is Repeated Calls. If someone calls you twice within three minutes, second call will come through. The best way to have a video conference. But one catch: it only works over Wi-Fi. In iOS 6, enabling FaceTime over cellular. Wi-Fi or cellular data connection for FaceTime call. Also, unifying your phone number and Apple ID. So if someone calls you on your phone number, you can answer it on your iPad or your Mac. And the same thing with iMessage. So if someone sends an iMessage to your phone number, you can receive that and reply on your iPad or Mac. I’m really excited about the Do Not Disturb feature, and the fact that it’s schedulable. About 2/3rds of all mobile web traffic comes from Safari on iOS. As you heard earlier, adding iCloud tabs. Can see all your tabs on other iOS devices or Macs. Also adding offline Reading List. Now as soon as you add it to your reading list, download and cache to read even when you later don’t have connectivity. Adding ability to upload photos via Safari. Smart App banners. Some apps also have websites; go to your website, and Safari will pop up a banner letting them know there’s an app in the store. Tap it and customers go right to the store. If they’ve already installed it, tapping on it will swap over to the app, and website can tell app what the person was doing on the website, pick up right where they were on the site. Also adding fullscreen support in landscape on the iPhone. One of the really nice free features in iCloud. The best way to get your photos to all of your devices. Now adding Shared Photo Streams. Really easy way to share photos with your friends. Just choose photos you’d like to share, choose your friends, and you’re done. Friends receive a push notification, and photos appear in an album in the Photos app, and you can comment on the photos. Also goes to Mac in iPhoto and Aperture, view them in a web browser (on Windows), and even on your TV via Apple TV. VIPs: mark someone as a VIP and you’ll get a notification on the lock screen for that email, just like from a text message. Starred messages appear in a special mailbox. And there’s a special Flagged mailbox (yay!). Much easier to insert photos and video right in the compose window. And now open password-protected Office docs right in your iOS device. Pull to refresh messages in Inbox. Brand new app called Passbook. 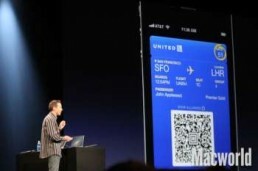 A lot of great apps to put boarding passes and tickets right in their apps. Store card apps where you get your store card right in their app. And movie ticket apps to put movie ticket right into app. Great, but when you get to movie theater or to the airport, you have to fumble around to find the app and then find the ticket/pass in the app. Combine all these together in one place, integrated right into the OS. Created templates to make it easy for developers to create passes and tickets. Integrates with lock screen. When you get to the movie theater, your pass automatically pops up on the lock screen. Starbucks card even shows you your balance automatically. Coupon for Target. An express check in card for the W at the hotel. When you’re done with a card, it automatically “shreds” it (complete with animation). If phone is locked and you go to Starbucks, you get a notification. Swipe to open card. Cards are live; if gate changes, your boarding pass gets updated right in the app. Set out to make the most accessible devices of anyone for all of our customers. Really proud of how accessibility community is adopting iOS devices. Want to make that experience even better. Lots of great apps designed specifically for kids with autism. Problem is settings that you don’t want kids to access. You can just circle the controls to disable them. And you can disable Home button so it doesn’t leave the app. Allows children with autism to learn independently. Great beyond that. Single-app mode, which has a lot of applications. Schools, for example, administering tests on iPad. Allow teachers to lock students into the test. Also, museums who use iPads and iPod touches for guided tours. Built an entire new mapping solution from the ground up. Doing all cartography ourselves. Worldwide effort. Showing shots of places all around the world. Part of Maps is local search. Already ingested more than 100 million business listings. Bring up info card. Integrated with Yelp to get reviews and ratings. Also building a traffic service. Easy to see where slow traffic is. On top of that, overlay incidents, so easy to figure out if traffic is likely to speed up. In addition, using anonymous real-time crowd sourced data right from iOS users, to keep traffic fresh and up-to-date. Also building in turn-by-turn navigation. Once you find a place, just tap on Quick Route button and you’re on your way. As you go, monitoring traffic, give you your ETA. If traffic slows down, update ETA and offer you a faster route if you can reroute. All of this works from lock screen as well. 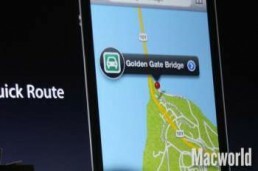 And of course, integrated with Siri, so you can ask Siri to take you somewhere. You can ask questions along route, like where to get gas, and it will look for gas along your route. A really fun feature they’re adding is Flyover. Have been flying major metropolitan places with planes and helicopters. 3D models on iPhone and iPad. All Maps are vector based. Really fast, When you rotate, it even rotates all the labels. Zoom in far enough and you see buildings. Tap on a point of interest to get an info card. 3D map mode to see wireframes of what buildings look like. Satellite view, but here’s flyover. Rotating 3D model of the Transamerica Pyramid. Rotate and flyover with your own controls. Last thing is turn-by-turn directions. Simulator since we can get go and get in a car. Adaptive cinematic camera angles as you go through corners. Tap on Overview and you can see the whole route, zoom in and pan around. 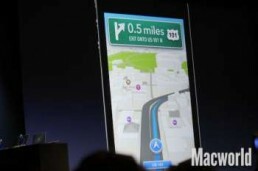 A brand-new mapping solution from iOS 6. Only 10 of more than 200 new user features in iOS 6. Game Center challenges; hit an achievement or high score, challenge your friends to beat you. Improved privacy controls. Redesigned the stores. Working on made for iPhone hearing aids. Added per-account signatures in Mail for personal and work mail accounts. Added Lost Mode to Find My iPhone, so if you’ve lost or misplaced iOS device you can send a phone number directly to that phone. Then people who find can tap on there and it will call that number back. All those features for China for OS X are on iOS 6 as well. Also incredible release for developers. APIs for Pass Kit for Passbook; reminders API; in-app content purchases. You can now sell music right in your app with an in-app content purchase sheets. Transit apps. The best transit apps for metros, hiking, biking, are coming from devs. Instead of building ourselves, Apple will promote devs’ transit apps. Beta of iOS 6 to developers today. Ships this spring. Supports iPhone 3GS or later, second and third generation iPad, and the fourth-generation iPod touch. And here comes Tim back on stage. Wow, there’s a lot in there. Of course, we’d heard about Mountain Lion before, but nothing about iOS 6. The new MacBook Pro with Retina display. The most advanced Mac Apple has ever built. OS X Mountain Lion. The ninth major release of the world’s best operating system. It’s the best OS X yet. iOS 6, with two hundred new features. World’s most advanced mobile operating system. Entirely new Maps app, Facebook integration, shared Photo Streams, and much much more. And that’s it, ladies and gentlemen. Wow. A lot to process there. Thanks for tuning in, we’ll have a more in-depth look at the announcements throughout the day.